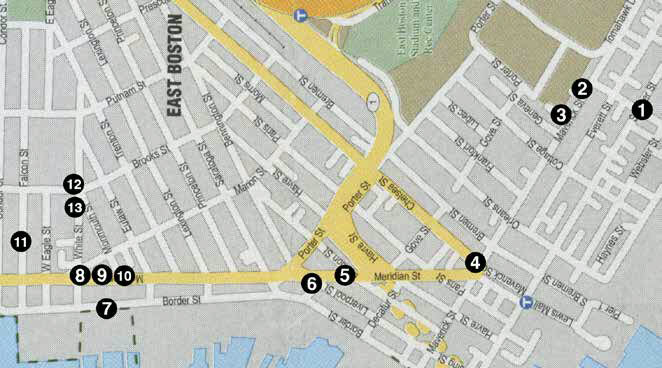 East Boston was created by connecting five islands using landfill. Noddle Island served as grazing land for cattle. Hog Island was renamed Breed’s Island. Governor’s Island, Bird Island and Apple Island became part of the expansion of Logan International Airport. East Boston has long provided a foothold for the latest wave of immigrants. Today East Boston is the home of more than 40,000 people. When Annie joined the Navy, she was one of thousands of women entering military service. She was assigned to the Portsmouth Naval Yard, a vital location during World War I. Annie fell ill and eventually died from the Spanish flu at the age of twenty-five. She was given full military honors. In 1968, a new activism erupted on the streets of East Boston due to the expansion of Logan Airport. Women began to block the movement of trucks along Maverick Street. The Maverick Street Mothers staged protests that resulted in an alternate truck route. They scored a victory, but their beloved Frederick Law Olmstead-designed Wood Island Park had disappeared. Marion was the daughter of Italian immigrants. She attended Tufts College and in 1933, was one of two women who graduated from Tufts Medical School. She served an internship at New England Hospital for Women and Children from 1933-1935. As a general practitioner and obstetrician, she delivered thousands of East Boston babies. Harriot and Margaret were social activists. In 1909, the sisters opened the East Boston Dispensary, an outpatient clinic to provide for the mostly Italian-American patients. By the mid-1930s, 40,000 patient visits were being recorded annually. In 1932, Harriot and Margaret, both national golf champions, founded the Curtis Cup, the best-known team trophy for amateur women golfers. Bridget, the great grandmother of President John F. Kennedy, met her husband, Patrick, on the boat immigrating to Boston in 1849. The Kennedys had five children. After Patrick’s death, Bridget became a successful businesswoman, opening a small stationery and notions store in East Boston. This paved the way for the future success of her son Patrick “PJ” Kennedy. Mary, grandmother of President John F. Kennedy, was a member of East Boston’s Irish elite. “Mame” married Patrick Joseph “PJ” Kennedy and had three children. Her son Joseph, President Kennedy’s father, was groomed to fit into Yankee society. She sent him to Boston Latin School and Harvard College. Mary was active in politics, including women’s suffrage. Armeda was an abolitionist who helped escaped slaves. In 1850, she moved to East Boston, joined the Maverick Church, and worked as a missionary for the City Missionary Society. During the Civil War, Armeda became the first female nurse for the Union. After the war, she returned home to continue her work for another twenty-two years. The Hyams sisters along with their brother, Geoffrey, supported a settlement house and social service activities in East Boston for many years. In 1937, they established the Fresh Air Camps for local children suffering with tuberculosis. Isabel, an 1888 graduate of MIT, began the experimental Penny Lunch Club to provide Boston students with nutritious lunches for one or two cents. Eleanor’s father taught her the mathematics of navigation at an early age. She married Captain Josiah Creesy and together they sailed around the world. In 1851, they decided to race several other ships sailing from New York to San Francisco aboard the clipper Flying Cloud. They broke the previous record by eleven days. At age sixteen, Mary Ann married Captain Joshua Adams Patten, accompanying him on two voyages aboard his ship, Neptune’s Car. When he became ill, Mary Ann, pregnant with her first child, bravely took command of the 1,600-ton clipper ship. She navigated through dangerous waters and brought it safely around Cape Horn to San Francisco. Fran was a tireless community leader who advocated for youth, the arts, and neighbors in need. Fran was instrumental in the founding of Meridian House, a residential substance abuse treatment program for men and women. The Don Orione Home honored Fran with “Fran’s Wall of Hope” which contained works of art by local artists. Caroline became the director of an early settlement house, Trinity Neighborhood House. The children had a variety of experiences in nature, arts and crafts, music, dancing, reading, and field trips. “Orrie” and her staff inspired leadership skills and volunteer spirit. A room at Trinity House is named in her honor. For many decades, Grace was a dedicated receptionist at Trinity House. She inspired many young children and taught them to love all creatures “great and small” as the Nature Counselor at Trinity Camp. Grace and “Orrie” were Girl Scout Leaders, mentors, and exemplary role models. Grace was a tireless volunteer in her community. Ethel was a talented milliner who created stylish hats for East Boston’s wealthiest ladies in the 1920’s. She was a generous contributor to many religious activities and holiday fairs. Ethel was selected to restore the tattered flags in the Hall of Flags in the State House along with other seamstresses. Helen was taught swimming by her father and trained primarily in the ocean. She was formally coached for one year before she qualified for the Olympics. At the age of seventeen, Helen represented the United States at the Summer Olympics in Los Angeles. She won a gold medal in the women’s 4×100-meter freestyle relay. Pauline was a prominent community leader and a Boston teacher. She headed the BPS Department of Physical Education for thirty-six years. She was also actively involved in the design of East Boston High School. The Business and Professional Group of Boston’s Hadassah named her “Woman of the Year” shortly before her death. Albenia married her childhood friend, Donald McKay, who with her help became one of the premier shipbuilders of his era. She was his mentor and teacher. As a team, they designed some of the fastest clipper ships in the world at their shipyard on Border Street. Thanks to: Boston Women’s Heritage Trail, BWHT.org, Dr. Edith De Angelis, Florence D’Avella, Mary Cahalane, Dr. Regina Marchi, Michael A. Laurano, Mary Smoyer, Cathy Licence, Marvin Pave, Hyams Foundation, Winthrop Library, Theresa Malionek, Suffolk University.